At the dinner for the Oscar nominees, Steven Spielberg first glances at László Nemes, then after a moment of contemplation slowly sits up and walks to the young director’s table. “I never thought we would have to wait this long for a film like this” After this first encounter something changes in recent Hungarian cinema and perhaps national self-image as well. In the flood of historical traumas like the Ottoman and Habsburg rule of the country, Treaty of Trianon in 1920, fascism and nazism, socialist dictatorship and failed attempts to gain economic and social advantage after the fall of communism, it was easy to mythicise this experience of failure. The idea that we Hungarians have a sort of externally imposed inferiority, a predestined disadvantage, moreover a national curse became commonplace in nationalistic political rhetoric. In situations of insecurity, a nation often closes its borders and finds answers in an antagonistic solitude. For decades now, it seemed like we have mostly made films about ourselves, for ourselves, giving up our chance to speak to the world, believing it wouldn’t listen to us. And less and less Hungarian moviegoers came to the theatres to watch films from their own country. My hope is that this kind of exclusion times out in the public eye. Now, we can safely say that Son of Saul is a major success locally and internationally. Perhaps because there is not a hint of that antagonism or exclusion in the spirit of the film or in that fateful moment at the Oscars for that matter. Quite on the contrary, this moment rings strongly and offers a way out from this national insecurity and weakness of self-victimization. It started when a young director who was born in Budapest but spent his upbringing in Paris first read “The scrolls of Auschwitz” and wanted to tell the story like it hadn’t been told before: that of a Sonderkommando member who tries to seek redemption by giving a funeral to a boy who he takes as his son. This film can hardly be used as a political device or as a tool to praise current film support policies (as many pro-government politicians have suggested before). It has not emerged from its political surroundings as the idea was conceived some ten years before its actual making and it is exactly its eagerness not to appeal to political sides or audiences that makes it so irresistibly authentic. No one can say that this film is glorifying one nation, one ethnicity, one political idea nor does it outline a strong alliance with objective truth. Like the camera-eye itself, it never leaves its protagonist, never digresses from the human, never shows a conclusive long shot of this world of coordinated chaos. It never tries to pin it down as a whole or convey it in an obvious manner. It throws details, hints in acting and choreography, cinematography and sound to give an overall impression of this world. A word that truly only exists in personal memory. The world of a concentration camp. Therefore our eyes are fixated on one man. Chained to motion and emotion. Motion that is orchestrated by his will, his circumstances and his limitations. Emotion deeply buried in secrecy. Let’s make no mistake here. He is not pushed around by his own destiny. As Imre Kertész suggests in his Nobel Prize-winning novel, “Fateless”: if we allow that “Jewish fate” to exist, we question the human agency and free will, arbitrarily applying logic to mindless genocide. Nemes leaves us without means to hold on to that objective logic, heroism, idealism, or truth that is the trademark of many Holocaust films (Schindler’s list, The Pianist, La vita e Bella). Like the main actor, Géza Rörhrig states, “The movie is for once not about the third one who survived but about the other two who did not.” Instead of trying to win the sympathy of audiences by showcasing the example of survival, Nemes introduces a hero in the opening who seems to be completely subjected to authority. As he puts it, he almost seems like a robot. But as we get a deeper insight into his actions the material of his world is slowly deconstructed. His resistance is made possible by an extremely novel interpretation of the protagonist’s environment. While we are made well aware of the chaotic nature of the concentration camp, we also realize that the formlessness of its nature provides a perverted freedom. While the nazi rulership comes in and out to interrupt Saul in his automatized routine as a member of the Sonderkommando, his status and mobility in disorder also give him, from time to time, a breathing space where he can carry out actions motivated by a sense of humanity. Indeed, he seems like a robot in the beginning, a dead man walking; and so he would remain, in this dance of the dead, if there was no intelligible drama. However, Son of Saul preserves an important element of the classical film sujet; a dramatic clash between individual will and social constraint. This is represented in Saul’s internal desire to bury the boy whom he calls his son. Whether this boy is indeed that son is left ambiguous, taking the film beyond the level of personal tragedy to create a map of symbolic references. Saul stands for the nameless victim of a mass murder. A man stripped of the power to articulate his intentions, dreams and thoughts living in a world where no one has the time or chance to listen. He doesn’t survive, he doesn’t come back at the end to reflect on his experiences from a safe historical distance. He is lost forever in an unbearable silence, in a pressing void in history. But we listen. The audience shares all his secrets with him, all his motions and suppressed emotions. This is the new, inventive form of drama in Son of Saul. Without our active companionship Saul would be a body simply moving through space. But we listen and we connect the clues because otherwise his acts would vanish in a fragmentary chaos. Like Saul, we can not turn around to see the whole picture. We can only put it together through active engagement with the subjective subtext. The rejection of the psychological relief of objectivity comes as very useful when someone wants to solve the problems of representing the Holocaust. The subject matter of mass uniquely leaves us with a bad taste in the mouth when fallen victim to the manipulation of cinematic practice. Not only that the subject matter needs to be somehow recreated as a movie set (a disturbing experience that Nemes recalls) but having been established as a mise-en-scène, it has to be somehow digestible by its audience. It has to not just provoke emotions, but tolerable emotions. Kracauer compares this phenomenon to the power of the shield of Perseus, which makes the vision somewhat lighter than it actually is. It seems as if cinema has to make events lighter, brighter, more sentimental, more satisfying than they actually are. But are the events of such horror meant to be transformed in this way? That is the very question that Nemes raises. His answer is not simply “no.” His answer is that in this case, all of cinematic practice should be humbly at the service of its material, as opposed to reaffirming the generic needs and expectations of its audience. Not to tell, but show, not to elevate but to present, not to project ideas and feelings but to listen to nuances and analyses. Therefore, Son of Saul becomes a raw, subjective, real-time experience. A performative display of often distant audiovisual clues. We listen to the cries of people in the gas chamber through the wall, we hear a shot from afar, we see people being shot and buried in passing, we see their piled up bodies in a blurred distance. 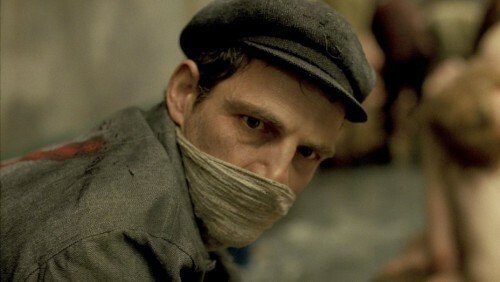 Son of Saul signifies an important shift in contemporary Hungarian cinema and a crucial artistic reinvention of the Holocaust film “genre.” The generation in which the Holocaust still lives as a personal memory is quickly disappearing. Our generation is one that is in touch with this tragedy mostly through documentation and artistic representation and less so through oral history. In a couple of years there will be no human face left that is resonating with the subjective, personal experience of the Holocaust. As László Nemes pointed out during his acceptance speech at the Oscars, the image that truly captures the agony of the Holocaust for him remains a human face. It is up for argument if he captured this face with an utmost precision but the attempt must nevertheless be appreciated. That is why Son of Saul is most importantly an ode of remembrance, secondly a gift to the arts, and thirdly a major gem in Hungarian cultural heritage. Perhaps, if it had only pursued the third one, it would have remained just and only that. Congratulations on your blog Benjamin. I cannot wait to see this important Hungarian film which you analyzed and described with such descriptive language and true heart.